The following section contains affiliate links. Read my disclosure policy for more information. If you’re not accustomed to the go-to ingredients for lectin-free followers, check out my article on all 12 Plant Paradox approved flours . I can find these at my local grocery store, but some of my readers in the far reaches of Remote, USA aren’t as lucky with the grocery selection. I’ve provided links to both Amazon & Thrive Market where you can buy the specific brands I personally use. Dr. Gundry recommends getting 12 tablespoons of olive oil per day. Putting two into your morning breakfast is only the beginning. Be sure to get a light, milder one that won’t overpower the vanilla. This brand from Thrive Market is my favorite brand for every use or this one from Amazon. In the remote mountain highlands of Asia, a group of Buddhist monks called the Luohan achieved enlightenments and ascension through meditation, prayer, and pure living. On the slopes of a primeval forest, the monks discovered and cultivated a rare fruit prized for its sweetness. This sacred fruit was named Monk Fruit, or Luohan Guo, after its devoted caretakers and was used in elixirs to raise chi, or life energy. Yup, you read that right. This stuff will increase your chi with its low glycemic deliciousness. Not to mention it could help you on your path to enlightenment and ascension. The only brand my store carries is Lakanto, which is a tasty, chi-raising blend of erythritol and monk fruit extract (both compliant sugar alcohol). It’s available for even less at Thrive Market. The final unordinary ingredient you’ll need for this is tigernut flour–my new favorite flour. It’s made not from nuts, but from slightly sweet-tasting root vegetables. This is the best flour for baked goods I’ve ever had, and I have made a lot of these mug muffins. The coconut/tigernut flour combo yields the fluffiest, most delicious cake texture ever. My favorite brand is available through Amazon Prime or Thrive Market. You can also get good coconut flour while you’re at it. 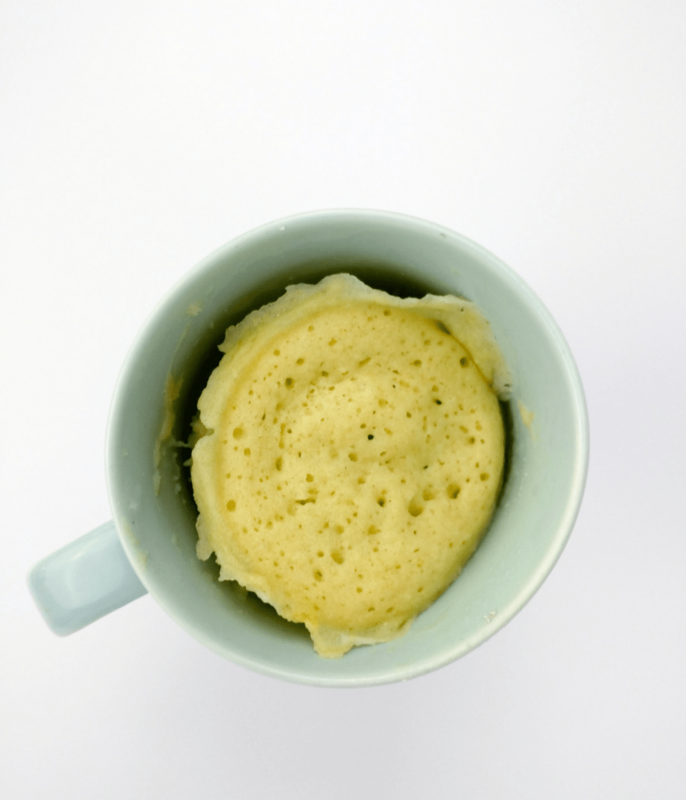 COMBINE the olive oil, coconut flour, tigernut flour, sweetener, vanilla, baking powder, and salt in a microwave-safe mug. Add the egg, and whip with a fork until texture is smooth and consistent, with no lumps. Be sure to scrape the sides and bottom of the mug. Fold in the fruit or chocolate chips, if using. MICROWAVE for 1 minute and 30 seconds. Let cool for a couple minutes, then shake out onto a plate. Serve plain or with butter, honey, or whatever topping you prefer. Get 5 free recipes a week. 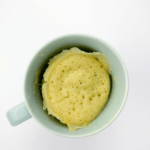 Fluffy, delicious grain-free, lectin-free vanilla muffin in a mug. COMBINE oil, coconut flour, tigernut flour, sweetener, baking powder, vanilla, and salt in a microwave-safe mug. Add egg and beat with a fork until batter is smooth (be sure to scrape the sides and bottom of the mug). Gently fold in fruit or chocolate chips, if using. MICROWAVE for 1 minute 30 seconds. 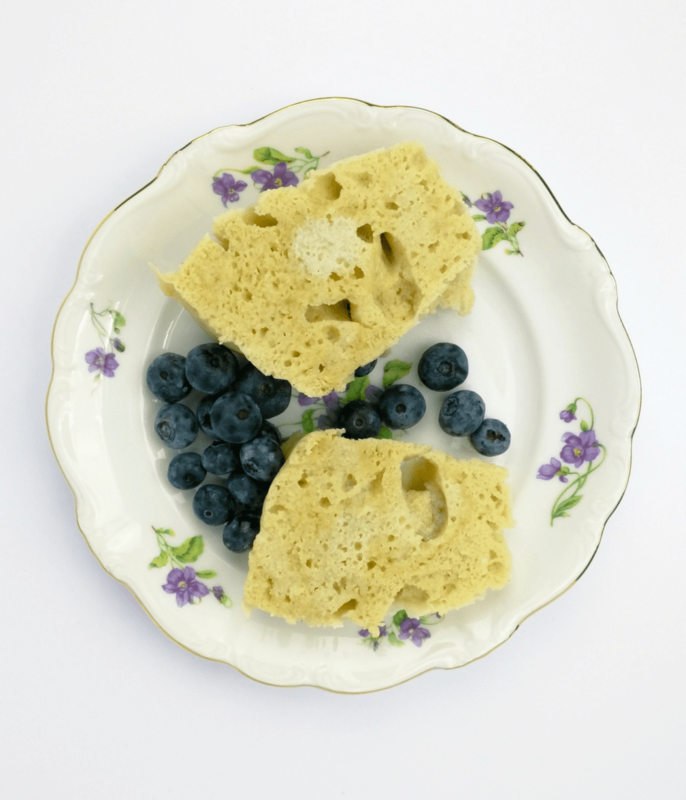 Let cool for a minute, scrape around the edges with a butter knife, and shake the muffin out onto a plate. Serve topped with butter, seasonal fruit, or as is. I just found out that I’m sensitive to eggs. Do you think a vegan egg would work in this recipe? Also, has anyone converting this to an oven recipe? Yes, absolutely! Are you sensitive to all eggs–even pastured or omega-3? Do you know the carb count for this? I’m doing Keto. 26g–probably not the best keto breakfast 😉 Although most of the carbohydrate in this is from the cassava flour, which is a resistant starch (it won’t be absorbed as carbohydrate in your body).